We met with Bennett's Pediatric Surgeon, Cystic Fibrosis Doctor and Gastroenterologist yesterday. It was a loooong but good day! Yesterday's clinic visits were especially good since Daddy was able to join us. Our first appointment of the day was with the Pediatric Surgeon, who we met to discuss Bennett's G-tube. We hadn't seen the surgeon since a earlier in the year. So, he was quite thrilled to see how well Bennett is doing. We discussed with him Bennett's long term use of the g-tube. 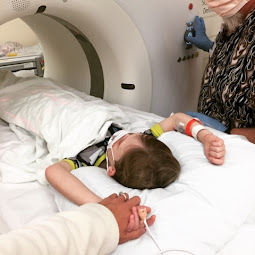 The Pediatric Surgeon will continue to monitor Bennett's g-tube yearly for as long as he has it. He explained to us the removal process should we decide at some point in the future to do so. But at this point, we are planning to just watch Bennett's g-tube sight for signs of infection and otherwise continue his g-tube use as normal. Our second appointment of the day was a visit with Bennett's Cystic Fibrosis doctor. 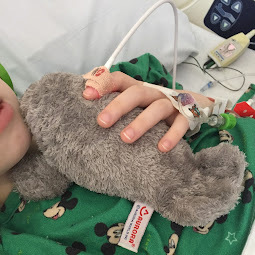 This started with bloodwork and a throat culture - two things that made Bennett pretty upset. We ended up returning from the lab to the patient room with Bennett upset. He had just had a feeding (through the g-tube) about 30 minutes before. Within minutes of walking into the patient exam room, Bennett vomited everywhere...all over his clothes...all over the floor...right onto Brian who was holding him. It was quite a mess. But Daddy was in good spirits and held our little one until we were able to get new clothes. Because always over-prepare for our doctor appointments, we brought extra clothes for Bennett, fortunately. Once dressed again, Bennett was back to his old self, playing chase with Oliver. Our appointment with the CF doctor went well. Bennett weighs 22.4 lbs, which means Bennett is in the 25th percentile and riding his growth curve nicely. 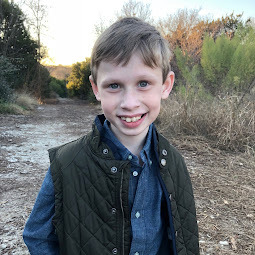 His lungs sounded clear and no new medications were added to the list (however, should Bennett's bloodwork or throat culture come back worrisome, new meds may be added later). Our last appointment was with the Gastroenterologist. The Gastroenterologist has recommended that we test Bennett for a milk allergy due to his previous intolerance of his milk-based formula. 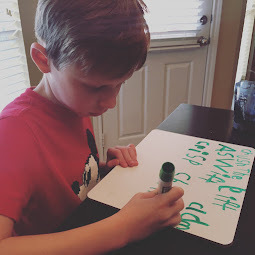 The hope is that his test will tell us he does not have a milk allergy and we can proceed to introducing new milk-based foods such as cheese. The GI doctor also diagnosed Bennett with a yeast infection, which he just began showing symptoms of a day or two ago. It was fabulous to be able to diagnose and treat that issue early. One last issue that has now crept back up is C.Diff. I'm 99.9% sure that C.Diff. has returned. All of the normal symptoms (projectile vomiting, lack of interest in food, diarrhea) have come back...symptoms we only seem to see when C.Diff. is lurking. Unfortunately, we ran out of probiotics for a few days and didn't give them to Bennett (probiotics can prevent C.Diff.). This was probably just the little window of opportunity that nasty bacteria needed in order to return. Thankfully, Bennett's poop was fast forwarded to the doctors office and we're waiting on the test results to return. Until then, Bennett will be fed Pedialyte to keep his nausea down. After our appointments, we walked over to the Children's Hospital Gift Shop. Oliver had had *very* good behavior during the day, despite that much of the day was spent sitting in small patient exam rooms waiting on doctors. So, we thought $6.50 was well worth buying a new toy car for him. Glad that clinic went well. Hope the c.diff isn't there. Hoping for good culture results..